...we sat trapped on the tarmac in Darwin for exactly 37 minutes before being able to disembark. The anxiety was peeking, as I knew we had a three hour or so drive to Kakadu, and sunset was not far off. Our itinerary boasted about the Nadab Lookout at Ubirr that had infinite views expanding across the Nadab Floodplains. We did NOT want to miss it! Luckily the roads are long and fast and we made it just in the nick of time to Ubirr. Thank the universe we did because sunset was freaking awesome! There's seriously something crazily magical about sunsets in the Northern Territory, and I can't explain eloquently in words, but there's an energy thats ancient and raw that shines as bright as the burning sun, and you can feel it so alive, that you can't help but feel connected by the rush. And yet... it is always serene, and you find yourself smiling, and at peace with the moment, as if you are right where you are meant to be. Well, at least that's how I felt this particular afternoon, even after a full day of flying and driving, I felt energised by Mother Earths precious gift. 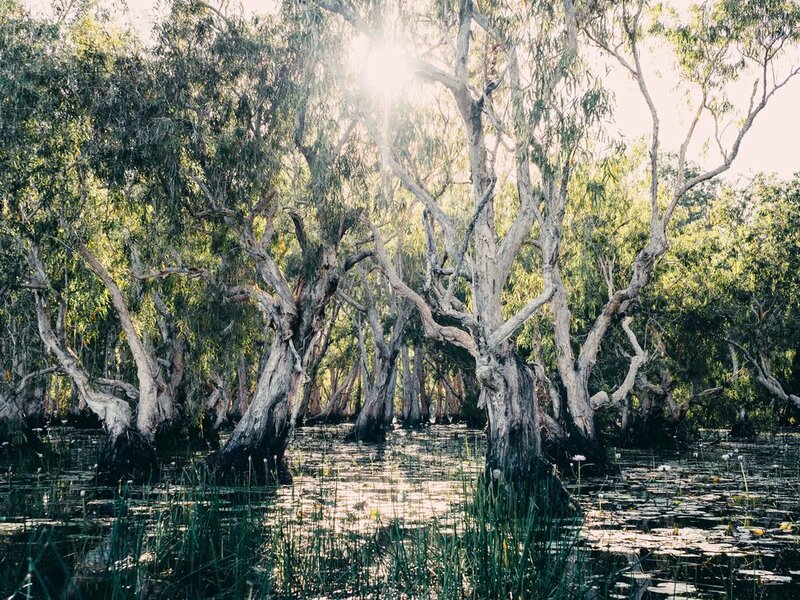 My first visit to Kakadu started with immense magical vibes, and I couldn't wait for the few days ahead! 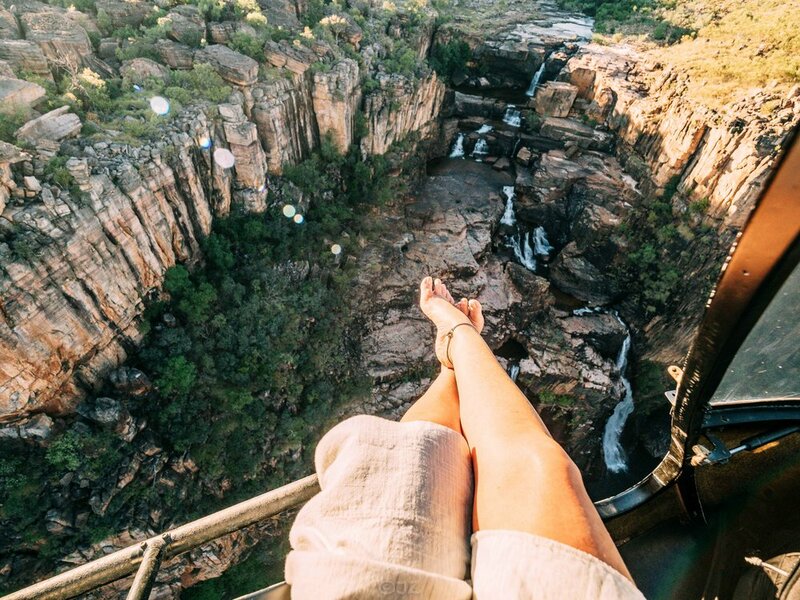 After a night at the Crocodile Hotel, we had an early start to catch a heli flight across the vast sandstone escarpments, endless floodplains and giant waterfalls that make up the thousands of square metres of Kakadu NP. Our trusty pilot Mark, of North Australian Helicopters already had the doors off and was ready to roll! The sun had just risen and the light was so golden it was almost blinding! The wind was strong but that didn't stop us dangling our feet outside of the chopper high above the incredible Twin Falls, and Jim Jim. It's the beginning of the dry season (Yegge season according to the aboriginals who recognise six seasons in the top end) but there is still signs of water flowing. 70 minutes in the air and my cheeks were sore from smiling so much! In the end I was so happy to put the camera down and enjoy the ride home, ready for the next instalment of our Kakadu adventure. Mid morning and it was time to leave Jabiru and head for Bamurru Plains a luxury style safari lodge with exclusive access to huge floodplains and savanna woodland on the Mary River, on the edge of Kakadu NP. We only had one night at Bamurru and we definitely made the most of it! Although I'll admit it. One night was definitely not enough and I didn't want to leave! That afternoon we explored the entire property by safari jeep (cue something made in the 80's which I loved! ), photographing water buffalo, wallabies, wild horses, goanna, bantang, and a million birds before settling back by the waters edge, in front of the lodge, for another awe inspiring majestic sunset, this time accompanied by bubbles and canapés. Honourable mention to the dinner that ensued btw. OMG! When chef told me (being the only vegetarian at the long table) that he was making me 'vegetarian lamb rack' I kinda giggled and kinda didn't, thinking he was only joking, and not sure if it was funny or not. Next minute, I had crumbed mash parsnip cutlets that could've been mistaken for real lamb cutlets just as chef had said! They were scrumptious, as was everything else on my plate at every single meal at Bamurru! Early next morning a bit of a dream of mine came true when we jumped on an airboat (yes an airboat!) and cruised around the wetlands, gliding through paperbark forests, watching buffalo chomp on water lillies, and having our sight and sound senses put in overdrive by a profusion of birdlife busy doing birdlife things! Absolutely magical morning that filled my heart to burst! While it was difficult to say goodbye to Bamurru Plains and its exquisite spectacle of wildlife on your very bungalows doorstep, it wasn't long before we were back on the road and chasing another beautiful sunset location. 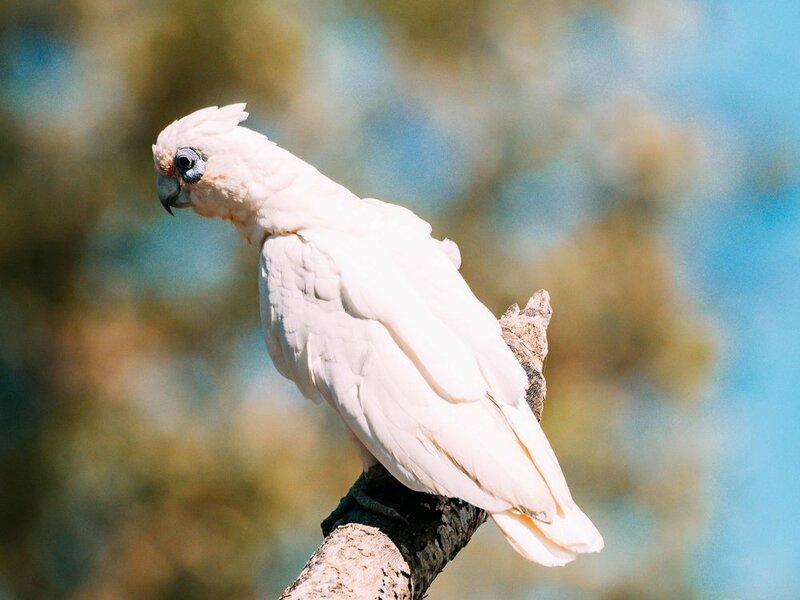 We checked in at the gorgeous little oasis called Cooinda Lodge nestled beneath a canopy of palm trees and paperbarks, beside the Yellow Water Billabong. Fast forward to a hasty drive to Nourlangie to climb to the top of the lookout, and Wow! World-class views across Anbangbang Billabong, Burrungkuy (Nourlangie Rock) and out to the Arnhem Land escarpment. What a place for sunset! 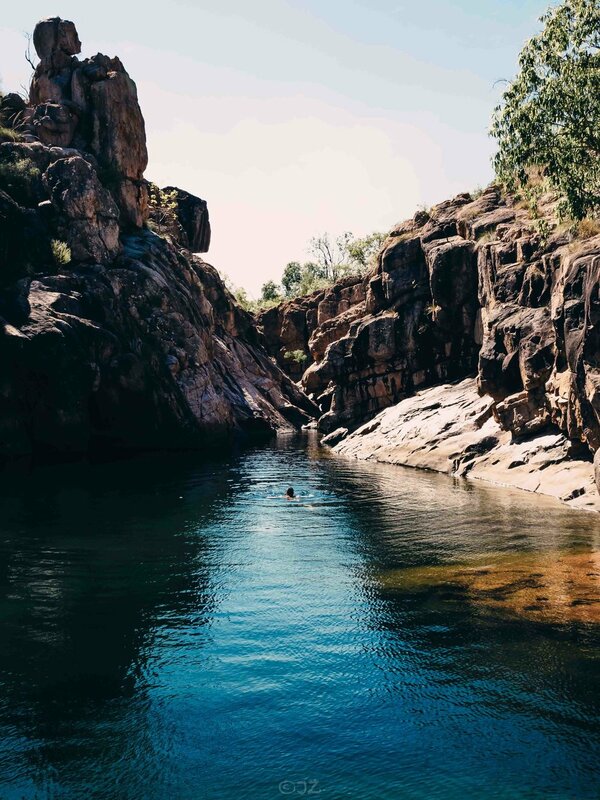 If you want to see the true grand scale of Kakadu, this is certainly the place to do it. Combined with the sacred stories of this special place, I couldn't help but fall endlessly in love. I can't tell you how many times I thought to myself throughout the trip, how truly unique and special this part of my beautiful country really is. The next few days were quite the whirlwind! 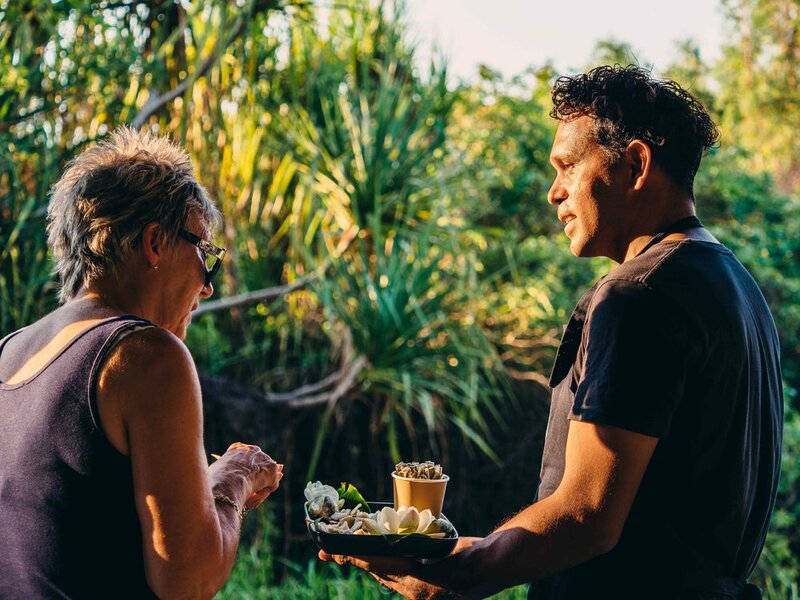 Besides sunsets and stars, we also enjoyed a few of the very special events that were part of the "TASTE OF KAKADU" festival. Listening to stories told by traditional elders and custodians of Kakadu, of the heritage-listed rock art galleries of Ubirr and Nourlangie, Lightening Dreaming and The Rainbow Serpent, was such a beautiful and meaningful highlight of the trip for me, as was the yam cook up and the teachings of edible plants and the connection to the land and the seasons that is still so important to the aboriginal community today. Another favourite 'Taste Of Kakadu" event was the Canapés on Yellow Water Billabong Cruise at sunset. Just exquisite, and a "MUST DO" on my list! Ummmmmm can I just say this out real loud... if I was to create a list of 'best natural infinity pools in Australia', GUNLOM FALLS would be at number one! How could I not know that this extraordinary paradise existed? I'm not gonna lie, the climb up the very steep rocky escarpment kinda killed me, but who cares! It was SO WORTH IT! I'm not even going to ramble on about the tiered crystal clear rock pools of emerald green and azure blue water with sandy bottoms, that cascade down one to another and another and another, or the endless view over the edge of the falls....just no, my words cannot do justice! Well, neither can my photos but they are still fomo inducing eye-candy, even if I do say so myself! I was so in love that I even stripped down to my bikini and requested (ordered, lol)... "take all the photos I demand of me in my bikini in all the different places please Garry!" or something like that! Unheard of! hahaha! All I will say is that Gunlom Falls has made it high on my list as a new fave place in Australia! 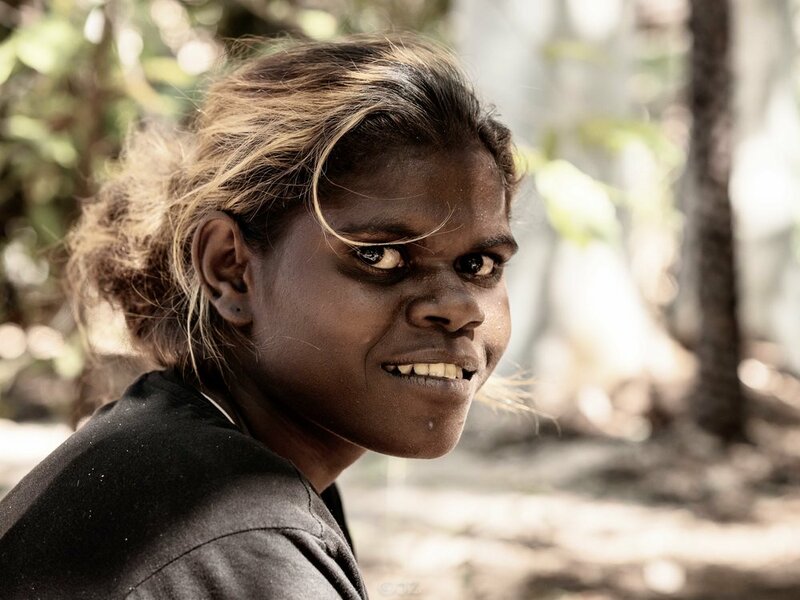 NT YOU ARE A UNIQUE AND EXQUISITE OUTBACK DREAM! "NO JEWELS. Just show some more pretty pictures to the lovelies and stop your yapping!" PS. I can't believe you're still here! 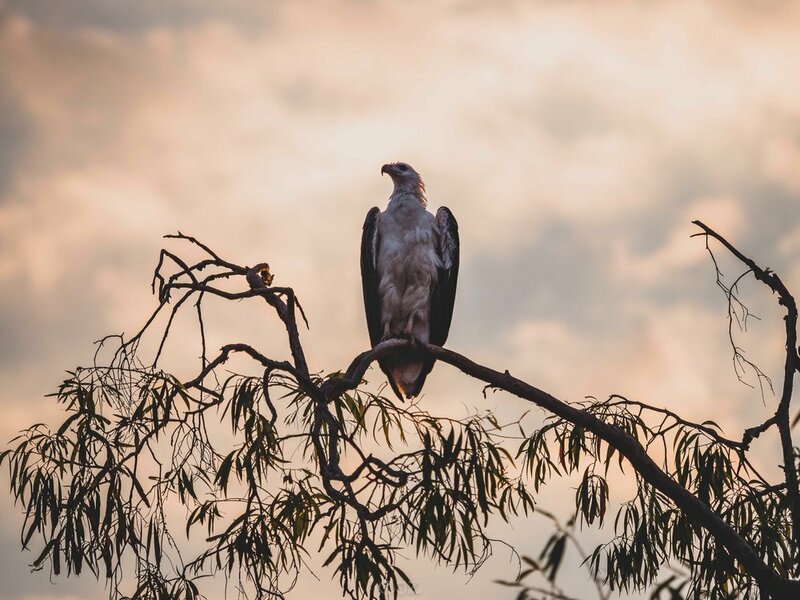 If you'd like to research a little more about the Northern Territory or Kakadu please click here. Thank you Tourism Northern Territory and Hannah for hosting us and for such a great trip! Thank you to Garry for putting up with me and being a great travel companion.